Jurgen Klopp believes Liverpool's performance in their defeat at Manchester City indicates how far his side have progressed this term. 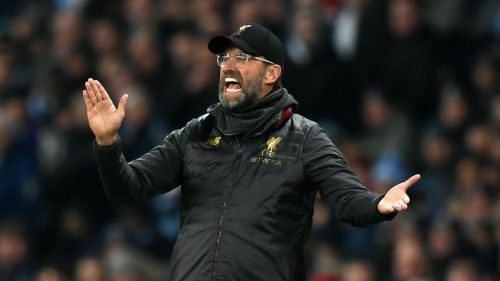 Premier League leaders Liverpool went down 2-1 at the Etihad Stadium on Thursday, the Reds' first top-flight loss of the campaign reducing the gap at the top to four points. Liverpool have a chance to get back to winning ways when they travel to Wolves on Monday in the FA Cup third round. Klopp is not concerned by how Liverpool will react to a defeat that breathed new life into the title race. "This game was different and an important step for us. A really tough game for both teams," Klopp told a news conference. "There are times when you lose games. It was the first one in the league but we lost three or four games before [this season], so no special thing. "Yes, we lost 2-1, but if you look at the game nobody would be surprised if it would have been a draw. "How I saw the game it was unlucky in decisive moments but that is absolutely okay because you cannot always be on the lucky side. "I said it after the game against City at home that they missed a penalty, that could have been a defeat and it wasn't, so things like that. "I was fine with the performance, the intensity of the game. We have won games against them, but in these games City were better. "Now it was 50-50, we had our moments, caused them completely different problems to the games before." Liverpool faced Wolves in the Premier League on December 21, with goals from Mohamed Salah and Virgil van Dijk ensuring a 2-0 victory. However, Klopp confirmed he will be making changes for Monday's trip to Molineux, with goalkeeper Simon Mignolet set to start. "We have to," Klopp answered when asked if he would rotate his squad. "We came through the intense period somehow okay, but we have to make changes. "Simon will play, of course. The goalkeeper position is a different one, but Simon, I could write a book about all of the good things I could say about him. "He's a fantastic professional. He did brilliantly so far, like all of the boys who don't play constantly, they keep the level really high in training, unbelievable high quality. "Simon is a Premier League goalkeeper, everyone knows that. It will be a difficult game, so good for a goalkeeper, he will get to show [his quality]."